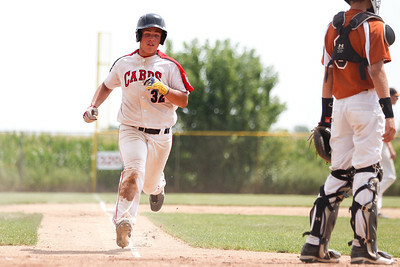 The Crystal Lake Cardinals fell to the Lyons Township Titans during a MCYSA Summer International Championship game Thursday, August 2, 2012 at Marian Central Catholic High School in Woodstock. 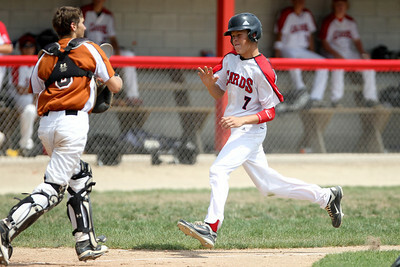 Mike Greene - mgreene@shawmedia.com Crystal Lake Cardinals' Jack Myers makes contact during a MCYSA Summer International Championship game against the Lyons Township Titans Thursday, August 2, 2012 at Marian Central Catholic High School in Woodstock. The Titans defeated the Cardinals 7-6. 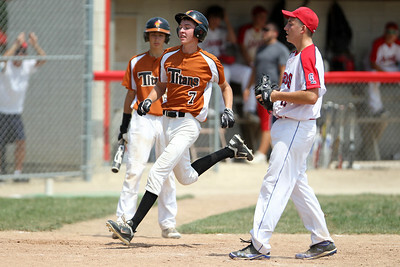 Mike Greene - mgreene@shawmedia.com Lyons Township Titans' Kevin Kotil passes by Crystal Lake Cardinals' Vinny Rottuno to score after a passed ball during a MCYSA Summer International Championship game Thursday, August 2, 2012 at Marian Central Catholic High School in Woodstock. The Titans defeated the Cardinals 7-6. Mike Greene - mgreene@shawmedia.com Crystal Lake Cardinals outfielders gather during a pitching change in a MCYSA Summer International Championship game against the Lyons Township Titans Thursday, August 2, 2012 at Marian Central Catholic High School in Woodstock. The Titans defeated the Cardinals 7-6. Mike Greene - mgreene@shawmedia.com Crystal Lake Cardinals' Aaron Braun pitches in relief during a MCYSA Summer International Championship game against the Lyons Township Titans Thursday, August 2, 2012 at Marian Central Catholic High School in Woodstock. The Titans defeated the Cardinals 7-6. 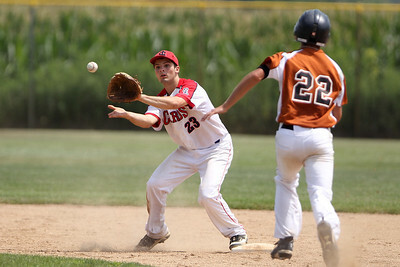 Mike Greene - mgreene@shawmedia.com Crystal Lake Cardinals' Jack Myers watches a ball into his glove while trying to turn a double play during a MCYSA Summer International Championship game against the Lyons Township Titans Thursday, August 2, 2012 at Marian Central Catholic High School in Woodstock. The Titans defeated the Cardinals 7-6. 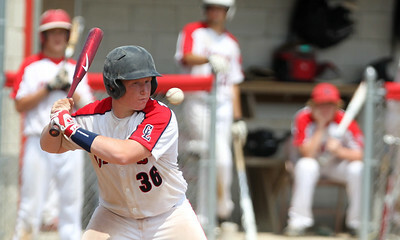 Mike Greene - mgreene@shawmedia.com Crystal Lake Cardinals' Ryan Granneman watches a pitch go by his head during a MCYSA Summer International Championship game against the Lyons Township Titans Thursday, August 2, 2012 at Marian Central Catholic High School in Woodstock. The Titans defeated the Cardinals 7-6. 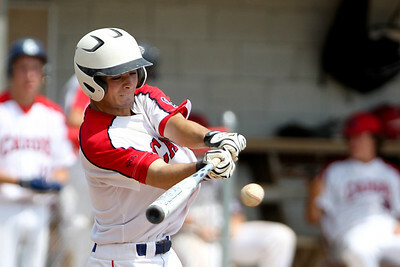 Mike Greene - mgreene@shawmedia.com Crystal Lake Cardinals' Jack Myers extends his arms to hit a ball during a MCYSA Summer International Championship game against the Lyons Township Titans Thursday, August 2, 2012 at Marian Central Catholic High School in Woodstock. The Titans defeated the Cardinals 7-6. Mike Greene - mgreene@shawmedia.com Crystal Lake Cardinals' Trey Schram pitches during a MCYSA Summer International Championship game against the Lyons Township Titans Thursday, August 2, 2012 at Marian Central Catholic High School in Woodstock. The Titans defeated the Cardinals 7-6. Mike Greene - mgreene@shawmedia.com Crystal Lake Cardinals' Richie Hernandez scores during a MCYSA Summer International Championship game against the Lyons Township Titans Thursday, August 2, 2012 at Marian Central Catholic High School in Woodstock. The Titans defeated the Cardinals 7-6. 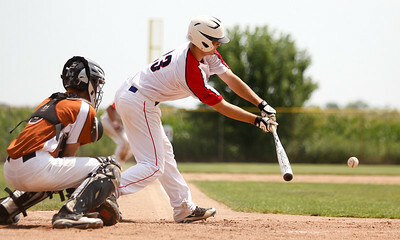 Mike Greene - mgreene@shawmedia.com Crystal Lake Cardinals' Trey Schram watches his hit fly through the air during a MCYSA Summer International Championship game against the Lyons Township Titans Thursday, August 2, 2012 at Marian Central Catholic High School in Woodstock. The Titans defeated the Cardinals 7-6. 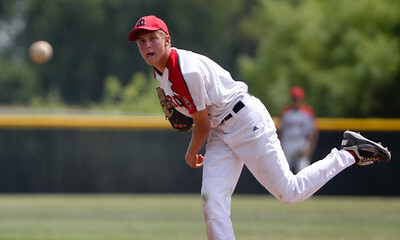 Mike Greene - mgreene@shawmedia.com Crystal Lake Cardinals' Riley Popell throws to first base during a MCYSA Summer International Championship game against the Lyons Township Titans Thursday, August 2, 2012 at Marian Central Catholic High School in Woodstock. The Titans defeated the Cardinals 7-6. Mike Greene - mgreene@shawmedia.com Crystal Lake Cardinals' Aaron Braun attempts to avoid contact with Lyons Township Titans' catcher Nick Gron during a MCYSA Summer International Championship game Thursday, August 2, 2012 at Marian Central Catholic High School in Woodstock. The Titans defeated the Cardinals 7-6. 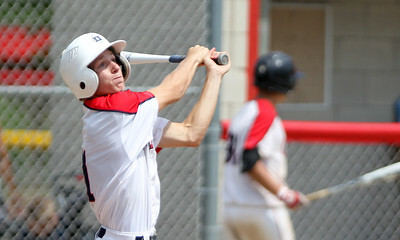 Crystal Lake Cardinals' Trey Schram watches his hit fly through the air during a MCYSA Summer International Championship game against the Lyons Township Titans Thursday, August 2, 2012 at Marian Central Catholic High School in Woodstock. The Titans defeated the Cardinals 7-6.